Stage I This is a kit that needs no double-flaring tools. Any of the short lines that need bending can be done over a can of WAD-40. 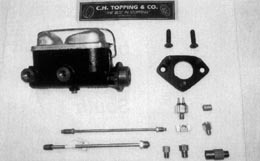 The STAGE I kit contains a dual-chamber master cylinder (different bore diameters are available for your situation), steel adapter plate and attaching flathead, countersunk bolts, stop light switch and in-line "T," two 12 inch lengths of 3/16 inch flared brake line with fittings and attaching adapters, and a residual check valve (per application). Proportioning valves are also available but are not part of the kit. Questions are encouraged. Stage II This STAGE II kit is for builders with double-flaring tools and tube benders. 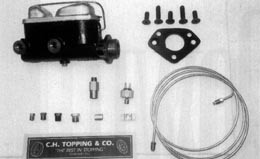 Like the first kit, it contains the master cylinder, steel adapter plate and bolts, stop light switch and in-line "T". Here's where the second kit differs. It contains one length of 3/16-inch brake line 84 inches long flared with nuts (longer or shorter length are available). The five line nuts come in sizes 3/8-24, 7/16-24, 1/2-20, 9/16-18, and 9/16-20. This should cover any adapting situation you may encounter at either port on the master cylinder or on the 3/16 brake line. Additional parts necessary to plum the complete car are also available.